Incredibly, these long serving switchboard operators share nearly 100 years of experience. 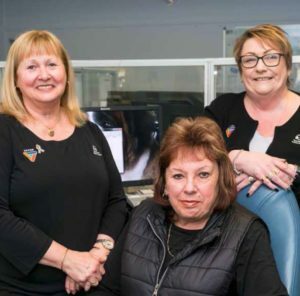 Vicki Burn, Lesley McWatt, Janine Stride and Elaine Howell have together racked up 97 years working on the Tasmania Police switchboard. Vicki, who joined at 22 years of age, has worked on the switchboard for 42 years – aside from a few years’ break after her son was born. She’s seen a lot of changes in her job, especially relating to new technology. “Back in the days when I first started, you only answered calls from Oatlands down and now it’s statewide,” she said. “It was a PABX phone system and in those days we answered the Triple Zero calls as well. There were two switchboard operators during the day and one at night along with one Senior Constable and two Constables in the Radio Room – that was it. But there’s some things that haven’t changed. “Everyone rings the police for everything – I can remember one elderly lady’s toilet was overflowing and she rang us. I told her to call a plumber or turn the stop tap off,” Vicki said. Taking hundreds of calls a day from upset or irate people, callers with mental health issues and accidental calls from children are all part of the job. The busiest times are Christmas Eve and Christmas night, AFL Grand Final Day, New Year’s Eve, and nights where there’s a full moon. But the ladies love their job. “The best bit is comradeship with the others and helping people,” said Elaine, who has worked on the switchboard for 28 years. “The more challenging part is dealing with upset people. The other day I took a call from a Sandy Bay resident who was most upset about the noise a yacht sail was making flapping in the wind,” said Lesley, who has worked on the phones for 13 years. “I try and treat everyone who calls, regardless of who they are, the way I’d like to be treated. It’s great, I really enjoy the work,” said Janine, who has worked on the switch for 14 years. Vicki thinks she will be in the job until she retires – “I’m too old now, no one else would want me,” she said with a laugh. Above: Switchboard operators Lesley McWatt, Vicki Burn and Patricia Clark. This page -- https://www.police.tas.gov.au/about-us/100-years-women-policing-tasmania-police/civilian-women-tasmania-police/switchboard-operators-share-almost-100-years-experience/ -- was last published on February 13, 2018 by the Department of Police, Fire and Emergency Management.